At The Easy Move, we want to keep your relocation safe and protect you from scams and shoddy practices. 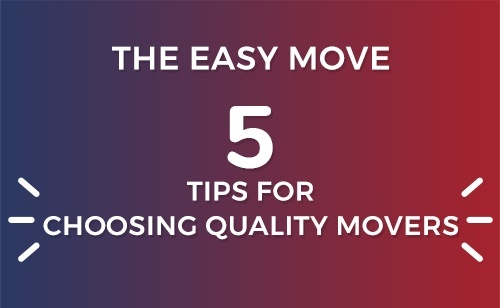 To do so, we have compiled a list of five tips to help you choose quality movers. Tip #1: Beware of fake moving companies. While attempting to find a low-cost mover, many have experienced moving company fraud. To verify whether movers are legitimate, check not only their active license but if their business is listed on the Better Business Bureau (BBB). It is also wise to stay clear of movers and internet van lines that have no drivers, agents or equipment. Tip #2: Beware of a fake address. The best way to confirm the authenticity of a moving company is by visiting their facility. This may take up some of your time, but it will clear your doubts and give you peace of mind knowing that your items will be stored safely. Tip #3: Beware of movers that charge a lump sum fee before completion of work. You can suspect foul play if the moving company charges a high fee before scheduling your move. Once they take your money, it is unlikely you will hear from them again. A professional mover will not need a fee upfront, they instead request for full payment after completing a job to your satisfaction. Tip #4: Beware of movers that give a low ball price. Movers can sometimes attract clients by offering them low price services at the beginning of their meeting. However, they often reveal hidden or additional costs at a much later stage. Clients are then left with no choice but to pay more than the quoted amount. Tip #5: Beware of unconcerned movers. There are times when moving companies brashly load items at the back of their truck, with no care or concern for the goods transported. An experienced moving company will provide services keeping clients’ best interests in mind and do not compromise on service or quality. Also, their trucks and equipment are clean and well maintained. It can be difficult to hire trustworthy and reliable movers, but if you follow these five tips, you will find a professional mover. If you’re moving and need to make the process as smooth as possible, reach out to the experts at The Easy Move. As London, Ontario’s most trusted moving company for residential and commercial movers, we are known for our service. Our team is not only professional and polite but also gentle and careful with your belongings. To learn more about the services that we provide, please click here. If you have any questions about moving or packing, get in touch with us here.